The science and the technology that has gone into producing even the best quality of tyre will go waste if the tyres are not inflated to the recommended pressure – Pressure comensurating to the load carried. The best performance of tyres can only be achieved when the tyre is inflated to the designated pressure based on the load per tyre. “Under inflation” or “Over inflation” on the tyre tend to impact tyre life, vehicle handling and safety. There are two factors with weight distribution of the vehicle. One is contact patch and other linked to the tyre wear. This result in heat buildup/tyre temperature and thus loss of tyre life, premature tyre removals, increased rolling resistance and fuel consumption. “Under Inflation” is more common than Over inflation. Tyre users are not always conscious about maintaining or matching tyre pressure to the loads carried. In pneumatic tyre the “Air carries the load”. 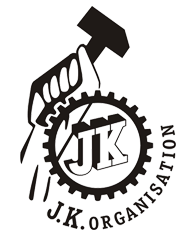 The best tyre performance and lower tyre CPKM are obtained by maintaining correct tyre inflation pressure. It is important to remember that the total weight (GVW) carried may not exceed the registered laden weight (RLW) or vehicle passing weight, but one side of the truck or one axle may be severely overloaded due to improper distribution of the load in the pay load platform or loading area. It is important to remember that even one trip of the truck, with improper load distribution may cause irreversible damage to the tyres. Excessive high speeds results in increased tyre running temperature. As the rubber gets heated up its modulus (stiffness) gets reduced. Rubber being a good non conductor of heat the residual heat is retained causing increased tyre wear and separation of components. A vehicle is said to be properly align when all the steering and suspension components and set as per the vehicle manufacturer and when the tyre wheel assembly are running straight and true. 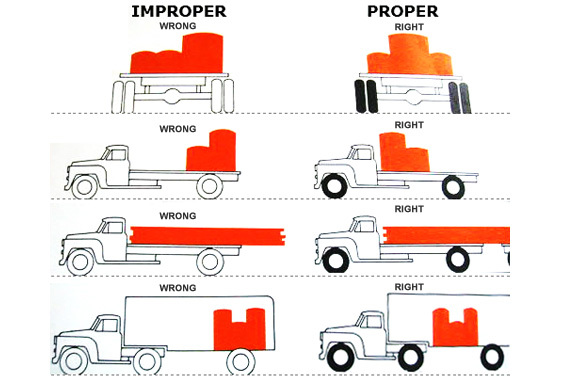 Proper alignment is necessary for perfect vehicle control, uniform and even tyre wear and safety. Recommended to get the vehicle alignment checked and corrected as per vehicle owner’s manual as soon as tyre are wearing unevenly or ride handling problems(vibrations, pulling to one side etc). 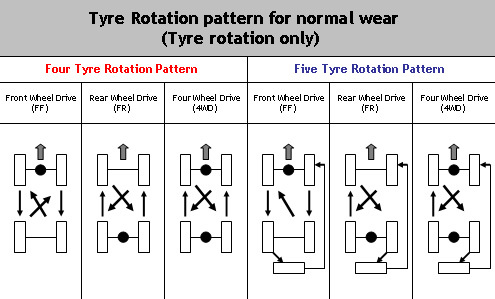 A wheel which is not properly balanced may setup vibrations which can affect steering control. Wheels, tyres and tubes are usually checked for balance before leaving factory. This balance is achieved by positioning weights on the wheel to counterbalance heavy spots on the tyre wheel assembly. Properly balanced tyres are important for driving comfort and long tyre life. Tyres should be balanced when they are mounted on the wheels for the first time or when they are removed for repair or periodically as per vehicle manufacturer’s recommendations. 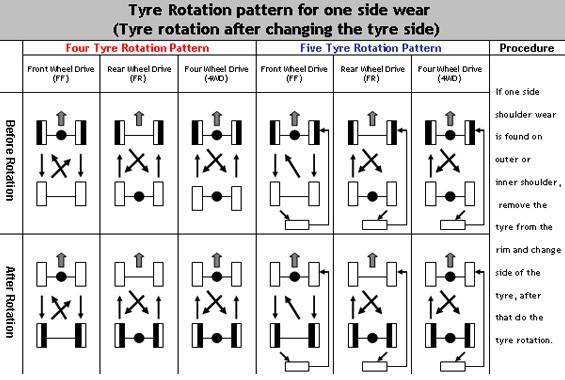 Rotation of tyre in a vehicle is recommended for a uniform tyre tread wear on all wheel position to achieve optimum tyre life. It is prefferred to rotate tyres as per vehicle manufacturers recommendation or in case of any uneven tyre wear noticed. It is suggested to check wheel alignment, wheel balance and suspension before the tyres are rotated. Rotation patterns /pictures to be incorporated. Vehicle /tyre operating conditions which significantly influence tyre life both in terms of new tyre life and structural durability. Speeding over pot holes, stone etc. Hitting the road, curbs, objects etc. Climatic and whether conditions in our country varies widely from region to region. Dry and extremely hot during summer, extreme cold during winter and rains during monsoon. This variation in climatic conditions influence tyre life in terms of mileage and structural durability. Tyre Pressure checks including the spare tyre must be done regularly at least once in two weeks. Tyre pressure should be checked using an accurate pressure gauge. Tyre pressure should be checked when tyres are cold. Under inflation and over inflation will cause rapid tread wear and premature tyre failures. Tyre pressure should always be maintained as per the vehicle manufacturers recommendations, mentioned at information placard, at door, owners manual.